Mt. 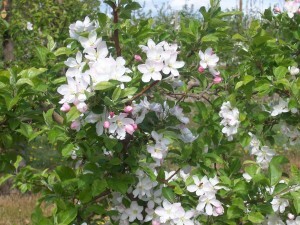 Blanc™ is a late blooming crab apple that blooms a couple of days after Snowdrift. Mt. Blanc™ produces an abundance of white bloom with good pollen compatibility. The selection is scab resistant. Much like Mt. Evereste™, Mt. Blanc™ can be easily planted into a high density planting without fear of overcrowding.